The Greater New Hampsire Linux User Group (GNHLUG) generally meets here. Take US Route 3, which is accessible from both the Route 128 and the I-495 beltways, north into New Hamphshire. Take Exit 5 and go East (W. Kinsley/Rte. 111) until you hit Main Street. Take a left and go through 2 sets of lights. Look for Martha's Exchange, a large restaurant in a red-brick building on your left. You can generally park on the street. Take I-93 South. When I-93 and the Everett Turnpike go separate ways, follow the Turnpike. You will soon come into Manchester. Follow the directions below for Manchester. Whether you're coming from the Manchester Airport, from Route 101, or from Concord down I-93, the trick is to take I-293 to the Everett Turnpike, then head South. Getting to I-293 is easy from Route 101, because they are largely colinear in Manchester. From the Airport, take a Right at the exit to the airport itself. Travel until you hit I-293, which you will take West, to the Left. Then get onto the Everett Turnpike heading South. 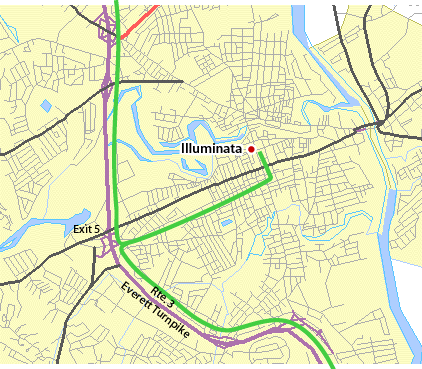 Once you come to Nashua, look for Exit 5, which you will take East (W. Kinsley/Rte. 111). Continue straight until you hit Main Street. Take a left and go through 2 sets of lights. Look for Martha's Exchange, a large restaurant in a red-brick building on your left. You can generally park on the street.